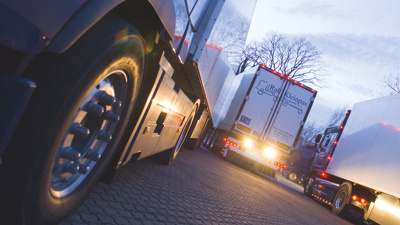 Video systems for truck & transporter – have everything in sight! Reversing is a tricky business, especially when you are not able to see what is behind you. Whether a car, truck, bus, motorhome or mobile market stall, as soon as you engage reverse gear there are risks everywhere: children playing, tight parking spaces, unfamiliar loading ramps and a whole host of unforeseen dangers... With a PerfectView reversing video system you will approach difficult reversing manoeuvres with the peace of mind to be able to see from the front what is happening behind your vehicle. With an additional side-mounted camera you will even see what would otherwise be hidden in the "blind spot". The video splitter PerfectView VS 200 Displays the video images from two connected cameras on a single monitor. Camera activation via control signals, such as indicators or reverse gear.